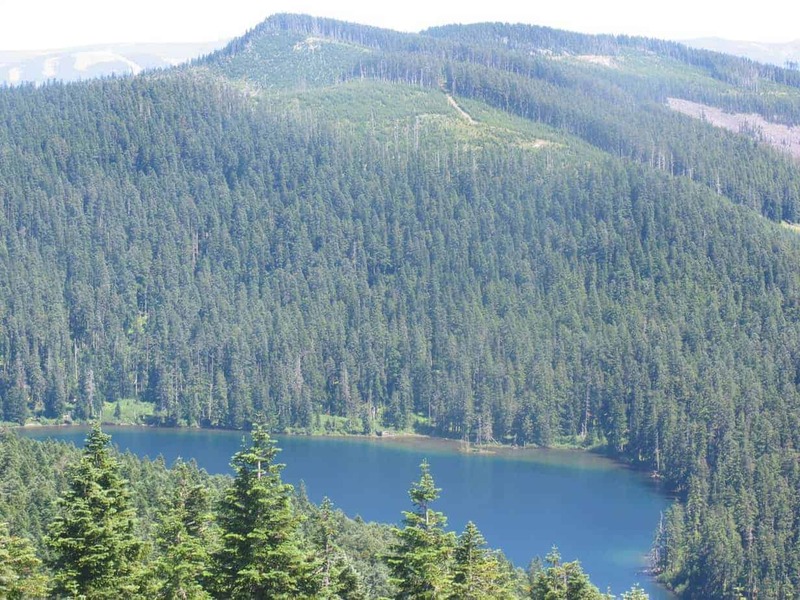 The amazing view from the top of Chinidere Mountain is more than worth the two-hour drive, and Wahtum Lake is a fine destination as well. 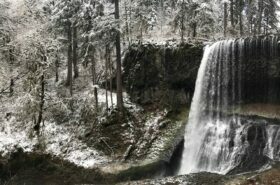 It’s one of the easiest and best hikes near Portland, if you’re looking for big view and little effort. 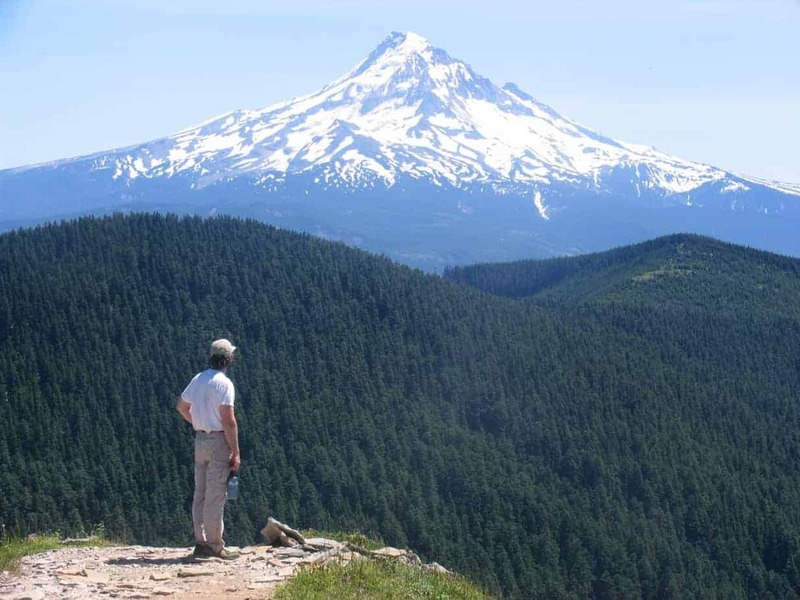 Consider making this a car-camping trip or part of a longer trip to Lost Lake or the Hood River Valley. Looking at Hood from Chinidere — the cover shot for my hiking book. Chinidere (which is pronounced “shi-ni-DERE”) is a short hike from campsites on the shore of a beautiful lake, which in turn is reached by driving an all-paved road. You can spend the night there, hang out by the lake, and then go up the not-too-steep hill for the big view, which covers something like 225 miles. Another benefit this time of year is you’re likely to meet thru-hikers on the Pacific Crest Trail, which wraps around the lake. The main pack of them is in Oregon right now, hustling north to beat the weather, and they’re always good for a story. If you really want to make their day and feel good about yourself, give them a salty or sweet snack, or something to drink besides water, and offer to carry their garbage out for them – then watch what happens! From I-84, take Exit 62, then turn right on Country Club Road. After 3 miles, turn left at a stop sign, onto Barrett Drive. After 1.3 miles, turn right on Tucker Road, which turns into Dee Highway. Go 8.5 miles to Dee and turn right on Lost Lake Road. After 4.8 miles, turn right on FS 13. Drive 4.4 miles farther, then make a right on FS 1310. Stay on the pavement, driving 6 miles to find parking (on the right). If the pavement ends, you’ve passed the parking area. 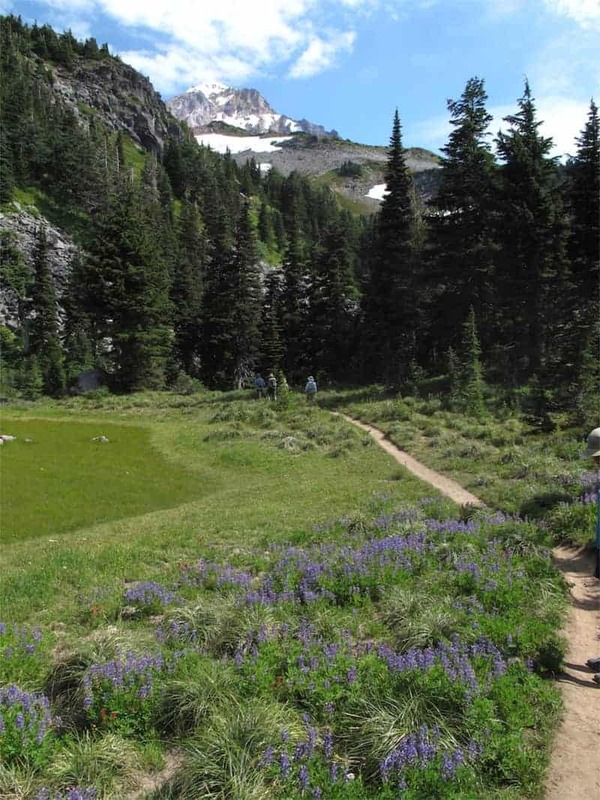 From the trailhead, walk through the campground (not down the road near the outhouse) and follow a trail called the Wahtum Express, which includes 250 wooden stairs. 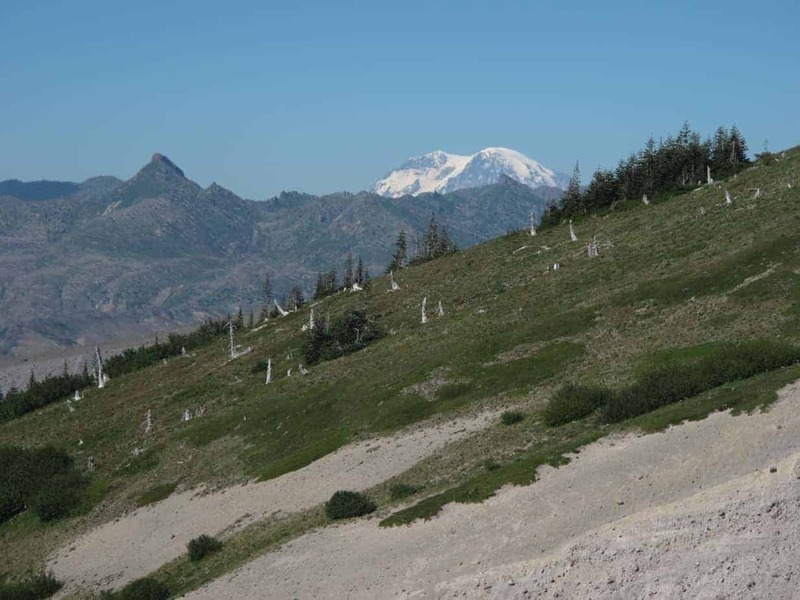 At the bottom of the Express, turn left and walk 100 feet down to a big tree with two Pacific Crest Trail (PCT) signs on it. You’ll be right by the lake, with a picnic area in front of you—and also in the middle of several nice lakeshore campsites. Turn right here, heading north on the PCT towards Canada. 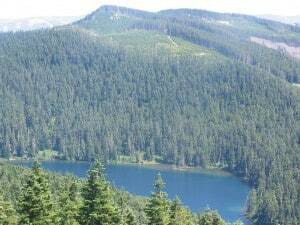 The trail meanders along at first, near the lake, weaving through a lovely forest, then about 1 flat mile, you’ll start climbing gradually. 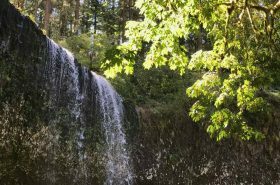 At a total of 1.75 miles, you’ll cross a creek that dries up by midsummer, and at 1.9 miles (now having climbed only 400 feet) you’ll intersect Herman Creek Trail, which leads all the way down to the outskirts of Cascade Locks. A tenth of a mile later, you’ll see Chinidere Cutoff Trail (406M) plunging down to the left; we’ll take that one back. 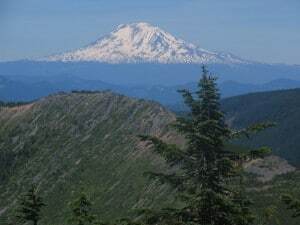 For now, go another 100 feet and leave the PCT, taking Chinidere Mountain Trail. Starting here, you’ll put in the climbing you’ve been warming up for, picking up 400 feet in a third of a mile to eventually reach the rocky summit, where the view includes Mount Hood, Mount Jefferson, Mt. Adams, Olallie Butte, upper parts of Hood River Valley, Dalles Mountain, and Mount Defiance, the highest spot in the Gorge. Off in the distance are Mounts Rainier and St. Helens. 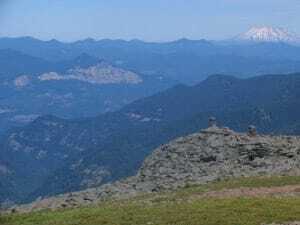 On a really clear day on Chinidere, I once saw Saddle Mountain, which is about 10 miles this side of the coast! 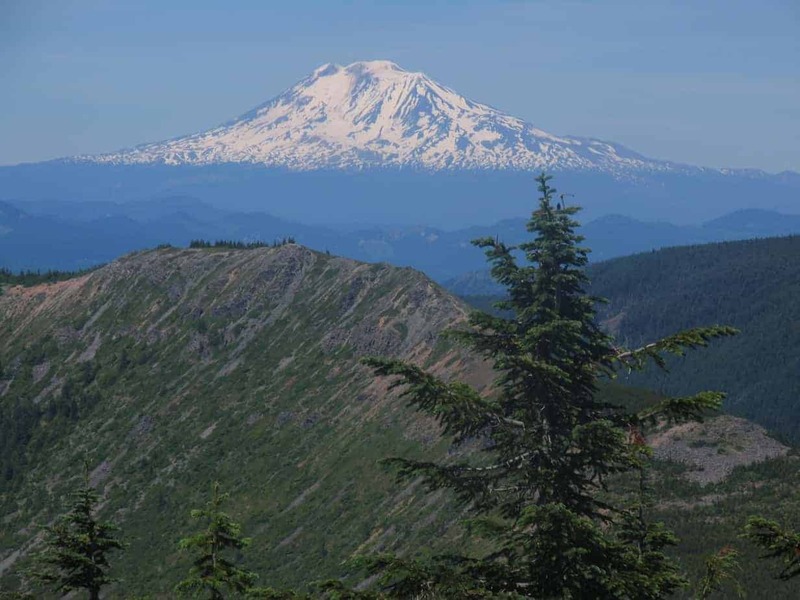 Head back down to the PCT, turn left, and take Chinidere Cutoff Trail, which descends steeply to the lake, where you’ll find more campsites. 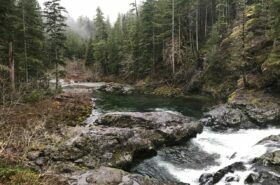 When you reach these campsites, stay on the main trail to where it crosses the East Fork of Eagle Creek on an impressive (and fun) logjam. Cross the creek on the logjam, and in 200 yards you’ll hit the top of Eagle Creek National Recreation Trail, which was built before 1920 and connects Wahtum Lake with the Columbia River Highway, 14 miles below. Turn left onto this trail and follow it a couple hundred yards back to the PCT, which leads 0.25 miles past campsites, swimming holes, and even the occasional beach, back to the bottom of the Wahtum Express—whose 250 steps will seem much less appealing to you now, no doubt.